Any inflammation caused to the middle ear is known by the medical term otitis media. Otitis Media is commonly found in children. Very rarely otitis media is seen in grown up people also. Acute otitis media (AOM) is often followed by Otitis Media effusion (OME) which is liquid like substance flowing out of infected middle ear. A small area behind the ear drum in the middle ear is filled with air. Eustachian tube is a small passage that connects this area filled with air to the throat. During called the middle ear space is filled with mucus. These mucus can get infected with germs. 1) Earache is a very common symptom. But this need not occur always. 2) Dullness in hearing may be felt for some days. 3) Fever is another common symptom accompanying Otitis Media. 4) Children may show vomiting tendencies and feel sick. 5) Young babies may not be able to point out the source of pain. They may cry load without stopping. 6) In some cases the ear drum perforates and this causes the effusion of the mucus fluid. Most ear infections gets cured within 2 or 3 days. If ear infection continues painkillers like paracetamol can be given for a few days. This will help to lower the temperature which can relieve the child from discomfort. Placing of local anesthetic medicine like lidocaine may also help to reduce the pain. If the pain does not completely vanish even after 2-3 days your doctor may suggest some antibiotics depending upon the merit of each case and considering the age of the patient. If the mucus behind the ear drum is not cleared within a week it can result in a glue ear and if this situation is continued it may lead to ear perforations also. These perforations will also heal within a few weeks. If the perforations continue for long periods then some treatment may be necessary for clearing the perforations. Mastoiditis is an infection caused to the bone behind the ear drum from the prolonged infection of the ear drum or the air cavity. Very rarely the infection can spread to the deeper inner ear and to the brain. So if the child does not show any improvement during the days of preliminary medication show him immediately to an ENT specialist who will be able to give proper attention to the child. 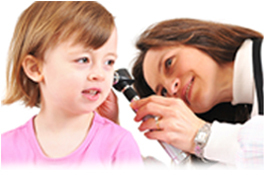 Normally a child will have two or more bouts of ear infection during his childhood. You cannot do anything to prevent it. But if you follow the following suggestion the chances of ear infection can be reduced. 2) Children should live in a smoke free environment. Passive smoking can stimulate the chances of getting ear infection. 3) Try to avoid infectious surroundings.